During operation process of concrete mixer, we need check whether the clearance between mixing blade and mixing drum bottom and side of forced type concrete mixer conforms meets requirements. If the clearance exceeds standard, it can thicken the remaining concrete in the wall and bottom of mixing drum, which will increase the difficulty of the cleaning work and reducing the mixing efficiency. If the mixing blades are worn, we need timely adjust, repair and replace it. 1.Check whether there is scratching phenomenon in rotation parts and materials drum before starting concrete mixer, and timely adjust it. 2. The concrete mixer can work after adding engine oil into the reducer box. 3. Lock the limit device of mixing drum before cleaning it. Then we start the concrete mixer, and if the rotation direction does not conform to the requirements after staring it, we should timely cut off the power supply, and then restart concrete mixer. 4. Feed the concrete mixtures into the mixing drum and close the mixing drum cover. Operators adjust the time according to the mixing time. 5. 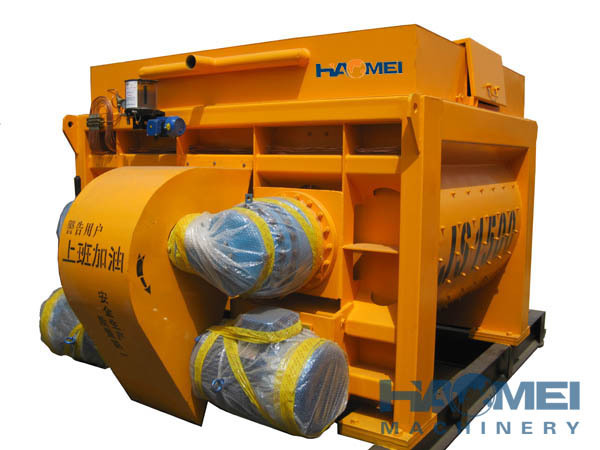 Clean the mixing drum of forced type concrete mixer. Pour some water to the mixing drum, and the remaining materials in the mixing drum will be eliminated by rotating shaft or sand.